The prehistoric remains of Ice Age horses, mammoths, turtles and a bison have been unearthed at a construction site in southern California. 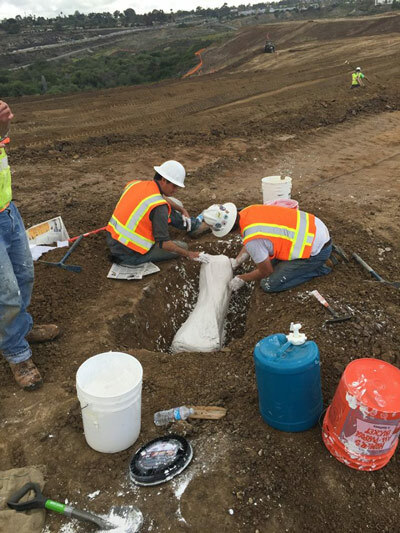 The treasure trove of fossils were uncovered at the Old Creek Trails work site in Carlsbad, south of state Route 78, in San Diego County. The site is earmarked for more than 600 homes. All the fossils date from the Pleistocene Epoch, and range from 50,000 to 200,000 years old, said Tom Deméré, the curator of paleontology at the San Diego Natural History Museum. Deméré says the fossils have the potential to tell scientists a great deal about the climate, the environment and ecology in the region at the time the animals were living. Large construction projects in California must have a paleontologist on site when large amounts of earth are moved. A mammoth bone is encased in plaster in preparation for removal. Work was temporarily halted to allow scientists to carefully remove the finds. Ure Kretowicz, the chief executive of Cornerstone, the company behind the site development, said the firm had worked closely with paleontologists throughout the grading, which is expected to continue for another two months. When a possible fossil is found, it is cordoned off and work stops within that area while paleontologists move in. The specimen has been moved to the museum, where it will eventually be placed on temporary display. The other fossils include at least two Columbian mammoths, an animal larger than the better-known woolly mammoths that lived in the northern latitudes of North America. Does this prove that horses are native to North America? I think so. It’s scientifically accepted that ancestor of horses originated in North America in its very primitive form but became the ‘horse’ we know today in the steppes of Eurasia, with the split between the Prezwalski’s horse (in Mongolia) and the Tarpan (in Russian steppe regions). Horses are only really considered to be horses after the development of the Prezwalski’s horse, so technically they didn’t evolve in North America but their very recent ancestors did, if that make sense. They then migrated to Eurasia 2.6 million years ago. The horse actually died out in North America around 10,000 years ago due to climate change and overhunting but has since recovered. Hopefully you find this interesting! Victor, I Agee with you! It is believed that the horse evolved here if you believe in evolution. The fossil evidence is proving the native american claim that horses always have been in North America. Some don’t like the truth, BLM, Welfare Ranchers and other horse haters. Hopefully these people will see the truth before our native horses are all wiped out by BLM.